Yay Easter time is here!!!! 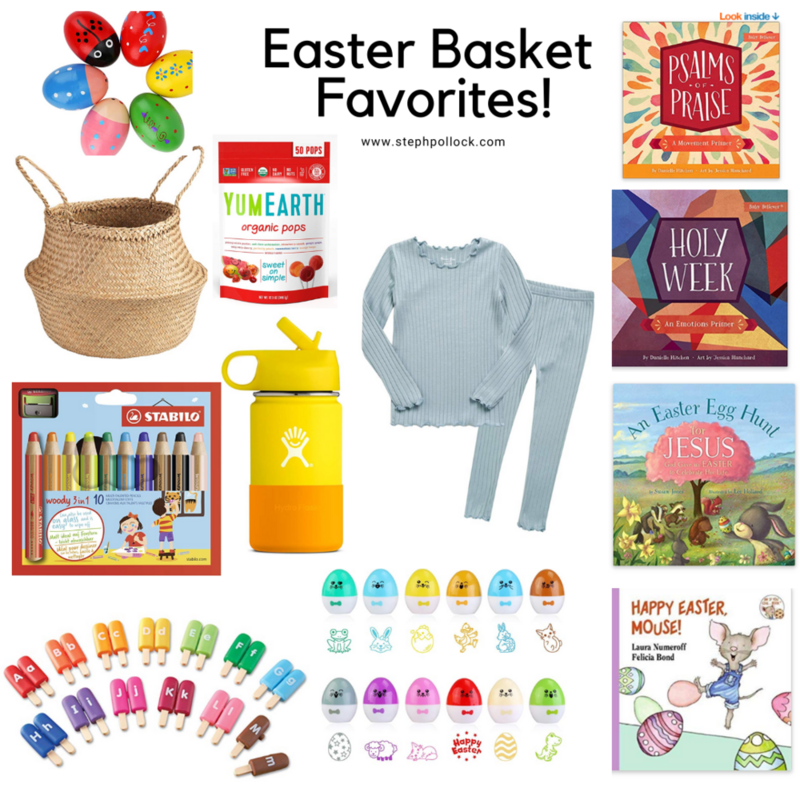 And guess what, Easter baskets can be fun and affordable and they don’t have to break the bank! I love celebrating with little gifts for the girls each holiday and I put together some of my favorite Amazon picks for you to shop! All you have to do is click on the links and it will take you right there. When it comes to baskets you can fill them with whatever. You can go a new favorite movie/candy route but I like to stick with the practical learning route but make it colorful and fun! Wooden Egg Shakers: We have these and love them. Both girls love them even though Pearl got them for her birthday. A very practical Easter egg gift that they will love all year round. Yum Earth Pops: We don’t do candy and stick to dark chocolate. But every once in a while I give the girls these suckers. Unfortunately I can’t find a sucker without natural flavors but these are pretty clean and colored with vegetables so you don’t have to worry about artificial/chemical coloring! The best Crayons you will ever buy! A little expensive but such high quality, pretty much unbreakable. Tip: don’t loose the sharpener!! It’s hard to find a replacement. Hydro Flask Water Bottle: I bought the girls these a few weeks ago and they are wonderful!! They come in lots of colors and haven’t dented yet! Pajamas: I’m pretty sure these are the most popular pajamas on Amazon. They are unisex. Lots of colors and so soft! I’d size up. ABC Alpha Pops: These are going in Olives basket to help learn her letters. Egg Stamps: These are cute and stamps are always fun. We love gifting crafts. Onto books! Around Christmas time I fell in love with this line of books that are simple ways to teach your babes about the Lord. I’m slowly adding to our collection. But I really like to make bedtime a learning time with these books. Olive also struggles with nightmares so I really like to read these stories about Jesus and teach Olive that she has power over her dreams and we pray peace and all the good stuff over here before bed. On that note, if your kiddo experiences bad dreams, you should read this article. Psalms of Praise: A Movement Primer (have this and love it) Especially the I lay down and sleep in peace page. A Easter Egg Hunt for Jesus : Got this one too! Happy Easter Mouse: We love this whole series of books and the girls Poppy & Lolly have gotten them these over the years! Loved: The Lords Prayer. I forgot to add this one above but its really great. Its the Lord Prayer but made really simple for kiddos.